The Electromagnetic Interactions (EMI) Group is led by Nobel Laureate Professor Samuel Ting. 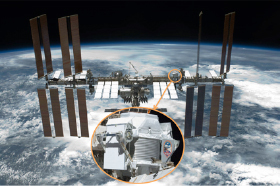 The EMI group initiated and led the development of the Alpha Magnetic Spectrometer (AMS), a multi-purpose magnetic spectrometer installed on the International Space Station in May 2011 and, for the foreseeable future, the only magnetic spectrometer in Space. The detector precisely measures charged particles travelling through the cosmos before they interact with the Earth's atmosphere. Cosmic rays can have energies of more than 1020 eV, so Space is providing particles with much higher energy than can be produced by any accelerator on Earth. AMS is a large international collaboration of physicists from 46 institutes representing 15 countries on 4 continents. The EMI group, as the leading institute in AMS, is responsible for the operation of the detector in Space, which is performed from the Payload Operations and Control Center (POCC) at CERN in Geneva, Switzerland. The detector operates on a 24 h/day 365 days/year basis and has already recorded more than 120 billion charged cosmic ray events, far more than in the entire history of cosmic ray physics. The EMI group also leads the data analysis efforts of the AMS collaboration. The physics objective of AMS is the measurement of the fluxes of individual cosmic ray species with percent level precision up to trillion electron volt energies. Our precise measurements of many different types of cosmic rays provide key information on the origin, acceleration and propagation of cosmic rays. In addition, these measurements allow us to search for signals of the annihilation or decay of dark matter particles in the Galaxy. To date close to 2 million energetic positrons and 350,000 antiprotons have been identified. Their measured energy dependences are in good agreement with models of annihilation of dark matter. Another objective of AMS is to look for primordial antimatter in cosmic rays to address the long-standing mystery of the excess of matter over antimatter in our universe. The most exciting objective of AMS, though, is to probe the unknown; to search for phenomena which exist in nature that we have not yet imagined nor had the tools to discover. Indeed all the results show extraordinary and unexpected behavior. AMS has published thirteen major physics results in Physical Review Letters, of which most were selected as Editor’s Suggestions. The precise AMS results are contradicting all previous measurements and current theories on cosmic ray origin and propagation. AMS is the only precision magnetic spectrometer in Space. It is exploring and discovering many new physics phenomena and it is an ideal experiment for graduate students. Figure 1. The Alpha Magnetic Spectrometer on the International Space Station. Figure 2. The positron spectrum measured by AMS based on 1.9 million positron events collected during the first 6.5 years of operation on the ISS. 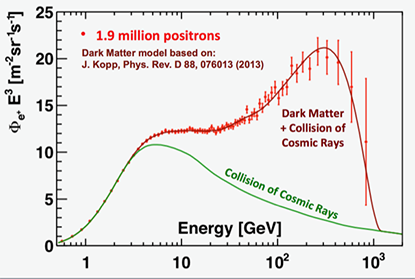 Also shown are the expected positron flux from the collision of cosmic rays with the interstellar medium and a model predicting an additional contribution of positrons from dark matter annihilations. M. Aguilar et. al., Phys. Rev. Lett. 110, 141102 - (2013). L. Accardo et al., Phys. Rev. Lett. 113, 121101 - (2014). M. Aguilar et. al., Phys. Rev. Lett. 113, 121102 - (2014). M. Aguilar et. al., Phys. Rev. Lett. 113, 221102 - (2014). M. Aguilar et. al., Phys. Rev. Lett. 114, 171103 - (2015). M. Aguilar et. al., Phys. Rev. Lett. 115, 211101 - (2015). M. Aguilar et. al., Phys. Rev. Lett. 117, 091103 - (2016). M. Aguilar et. al., Phys. Rev. Lett. 117, 231102 - (2016). M. Aguilar et. al., Phys. Rev. Lett. 119, 251101 - (2017). M. Aguilar et. al., Phys. Rev. Lett. 120, 021101 - (2018). M. Aguilar et. al., Phys. Rev. Lett. 121, 051101 - (2018). M. Aguilar et. al., Phys. Rev. Lett. 121, 051102 - (2018). M. Aguilar et. al., Phys. Rev. Lett. 121, 051103 - (2018).